Two years ago, just before Thanksgiving 2015, we shared Francesca Zambello’s delicious recipe for Pumpkin & Kale (or spinach) Lasagna, a perfect option for vegetarians as a Thanksgiving entrée (or for a hearty dish on a cold and snowy winter day). 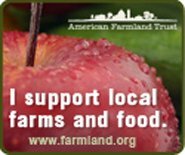 In preparing the recipe, the Berry Patch Farm in Stephentown (Rensselaer County, NY), which has a farmstand at the year-round Troy Waterfront Farmers Market in Troy (Rensselaer County, NY), was the source of the creamy colored gumbo pumpkins used to prepare the lasagna. 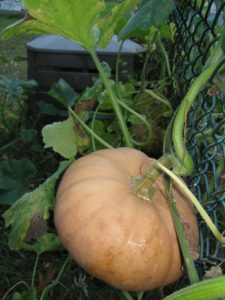 This past summer during the 2017 growing season I watched with wonder as a vine of pumpkins took root in the backyard compost bin. Even more wondrous, the backyard army of squirrels for some miraculous and unknown reason (but might it be the neighborhood cats?) left the pumpkins alone, no squirrel nibbling or scratching of the pumpkins as they grew. Were they growing from seeds of the 2016 Halloween Jack O’Lantern? 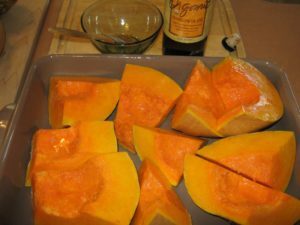 It turned out that they were rumbo pumpkins related to the 2015 Thanksgiving pumpkins used for the pumpkin and spinach lasagna prepared two years ago. With six or seven “volunteer” pumpkins growing out of the compost bin, I had “pumpkin on my mind”, and serendipitously, I noticed a reference to Deedee Stovel’s The Pumpkin Cookbook, 139 Recipes Celebrating the Versatility of Pumpkin and Other Winter Squash, 2nd Edition (Storey Publishing, North Adams, MA, 2017) in my local newspaper and decided to order a copy. 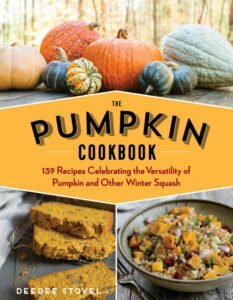 This wonderful cookbook not only has a range of recipes using pumpkin but also a fascinating chapter voicing praise for the versatile pumpkin which Stovel proclaims a superfood. Pumpkins happily grow in all climates across the United States. In fact, they grow on every continent except Antarctica. One of the many winter squashes, pumpkins have long been prized for their nutrition, adaptability, and staying power. The sturdy outer skin allows them to be stored in a cool place for months. Native to North America, pumpkins have been cultivated for about 9,000 years. For the indigenous people, pumpkin was a mainstay of their diet, and it has served as such for succeeding cultures. 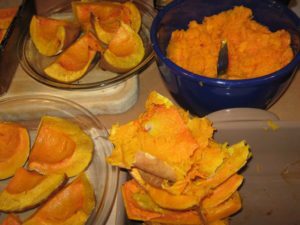 Pumpkin offers protein, complex carbohydrates, vitamin C, potassium, and huge amounts of vitamin A and beta-carotene, the precursor to vitamin A. It is high in fiber and low in calories. For sustenance, pumpkin is hard to beat. Deedee Stovel also includes in her highly recommended cookbook (first published with the title Pumpkin: A Super Food for All 12 Months of the Year and recently reissued as a 2nd Edition), a page on Cooking Pumpkin which describes the range of ways, from boiling, steaming, grilling, microwaving and roasting. I decided to roast half a dozen of the volunteer rumbo pumpkins and then mash the cooked pumpkin to prepare once again Francesca Zambello’s Pumpkin & Kale Lasagna. 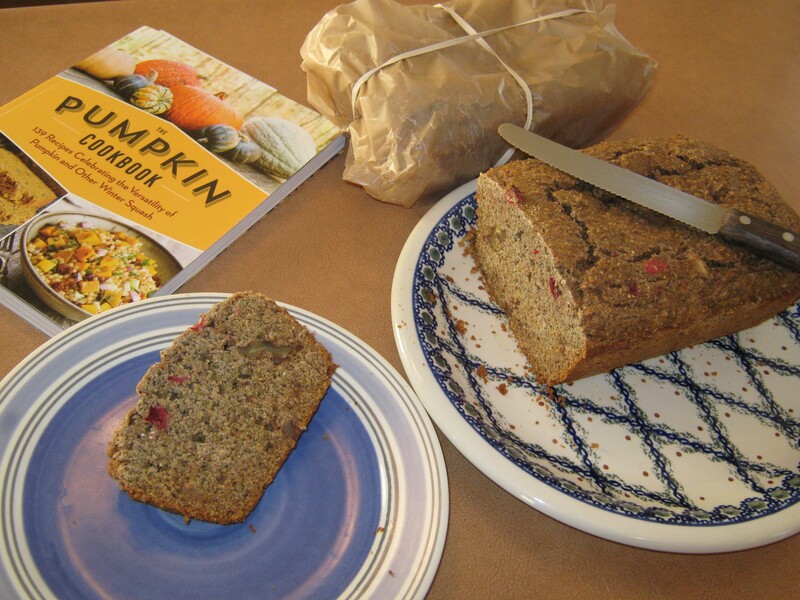 And after thumbing through Stovel’s cookbook (which has many appealing recipes for pumpkin main courses, side dishes, soups & salads, breads, pies, cookies, cakes), I decided to prepare her pumpkin cornbread recipe with some personal tweaking, by adding cranberries, using organic blue cornmeal, and substituting honey for sugar. In substituting honey for sugar, good advice (in the form of four rules) is provided at www.thekitchn.com: use less honey than sugar, reduce the liquids, add baking soda, and lower oven temperature. 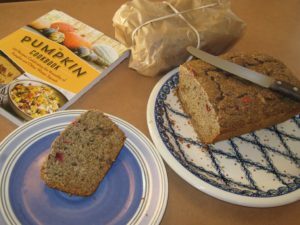 The two loaves of the cranberry, pumpkin cornbread (made with organic whole wheat pastry flour from Farmer Ground and organic blue cornmeal), which I baked at 325º instead of 350º resulted in a longish hour plus (65 minutes or so) in the not so hot (since recipe called for 350º) oven. Even so, the next morning the middle of one loaf, pulled out of the oven a few minutes before the second one, had sunk in a tad, indicating that another few minutes were needed! Delicious nonetheless.